3CX is a Unified Communications with a Software IP PBX. 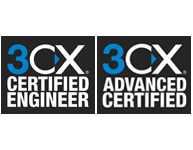 We hold 3CX Certified and Advanced certified qualifications for your peace of mind. For more information please click on the icon below or contact us.